iRonsnow is a registered brand in USPTO. Only iRonsnow Official is authorized Seller. Dimensions: 5" x 2.4" x 1.6"
Offers a choice of self-charge, solar and external recharge power options.Multiple ways to power/charge the radio: hand crank to wind up internal alternator, expose to sunlight to charge by solar panel, DC recharge by connecting the mini USB cable to computer. 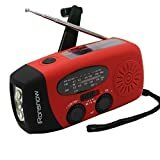 This is a self power emergency radio that you and your family can depend on, anytime anywhere, any weather.